The worldwide media tablet market recorded lower shipments for the fourth straight quarter, with 48.7 million units shipped in 3Q15, according to the latest market study by International Data Corporation (IDC). Despite early signs of a slight improvement, shipments were actually down -12.6 percent year-over-year. IDC estimated the global installed base of tablets to stand at 581.9 million at the end of 2014, which was up 36 percent from 2013. With mature markets like North America, Western Europe, and Asia-Pacific well past 100 million active tablets per region, the opportunities for new growth are fewer. "We continue to get feedback that tablet users are holding onto devices upwards of four years," said Ryan Reith, program director at IDC. IDC believes the traditional media tablet still has a place in personal computing. However, as the smartphone installed base continues to grow and as phablets become more capable, the need for smaller form-factor slate tablets is less clear. With shipment volumes consistently shrinking, the market now appears to be in the process of a significant transition. In response to these market development challenges, the consumer electronics industry is focused on new form factors with 'detachable' tablets. To date, detachable tablets gained a single-digit percentage of the overall tablet market, but IDC expects this share to increase over the next 18 months. That being said, the shift toward detachables presents some really big challenges. In particular, the mix of traditional PC OEMs that are selling detachable tablets will face pressure from the traditional smartphone and phablet OEMs -- many of which deliver extremely low-cost, high-value products. The first generation of detachable tablets failed, as they represented a series of compromises in terms of both operating system software and hardware. The devices shipping now are more capable, and IDC's expectation is that some tablet buyers may begin to embrace this form factor. Meanwhile, Apple still holds the top position in the worldwide media tablet market, although the iPad lead may have come to an end -- as the market for premium (high-cost) products has reached full saturation. 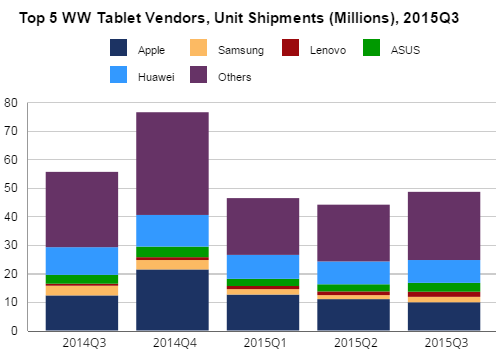 Competition from PC vendors with detachable tablets have contributed to a decline in iPad shipments. In the absence of a meaningful Apple innovation, the outlook for growth is limited.